Dryer vent distance to gas meter, air conditioners, other building features. 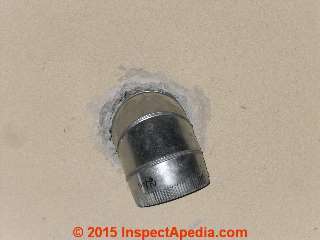 How far should the dryer vent exhaust opening be from various building features? What safety hazards are caused if the dryer vent blows lint on to a gas meter regulator or onto an oil burner? These conditions are unsafe, risking fire or explosion or loss of heat. Page top photo: a clothes dryer vent located just inches from an air conditioner compressor/condenser unit air intake screen risks clogging the condensing coil, causing A/C operating problems or even damage. 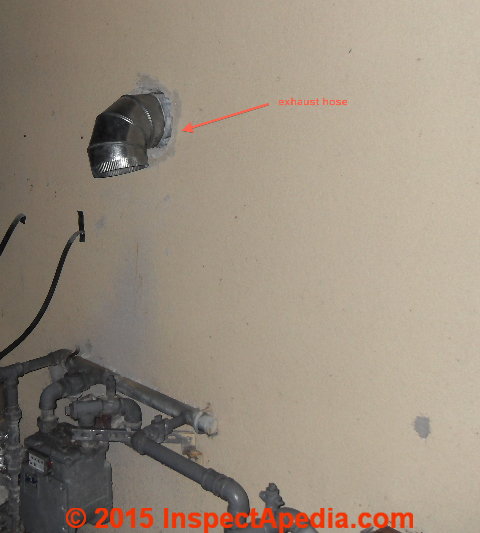 An InspectApedia.com reader provided this pair of photographs of a clothes dryer exhaust vent termination on the building's exterior wall. Above we see that there is no proper cover on this dryer vent: birds, rodents, or someone else can enter the dryer vent, nest therein, block up the dryer vent, and cause a dryer fire or a building fire. The clothes dryer vent, located about 20" above the outdoor gas meter is blowing lint all over the gas meter and its various parts. This might seem harmless but it's not. Lint blockage of the vent port on a gas regulator valve can cause a dangerous gas leak inside the building risking a fire or explosion. I haven't found an explicit model building code giving a minimum clearance distance from a dryer exhaust vent opening to a gas meter (or to the meter's regulator). The minimum distance of three feet clearance from the gas meter to the clothes dryer intake or exhaust vent opening is given by the article cited below. You'll see the three-foot rule commonly cited by gas company specifications such as our second citation just below. ... while other documents from the same manufacturer may show flexible dryer exhaust ducts installed and may recommend against 90 degree turns (Amana - Whirlpool 2017) - shown below. That may be fine if the dryer flexible exhaust duct is flexible stainless steel rather than plastic (mylar) and wire ducting. insects from entering the home. Do not use an exhaust hood with a magnetic latch. No obstructions by snow, flowers, rocks, plants, fences, walls, air conditioner condenser/compressor units, etc. Vent must fit over the exhaust hood. Secure vent to exhaust hood with 4" (102 mm) clamp. Run vent to dryer location using straightest path possible. Avoid 90° turns. Use clamps to seal all joints. Below we see a cloud of moist air blowing out of the clothes dryer exhaust vent and down onto an LP gas tank. We have more than the required 3-foot clearance between the dryer vent outlet and the LP gas regulator, and we noted that the gas regulator located outdoors and atop the LP tank is as a bit of additional protection from this blast of moisture and lint by a rubber cover. The risk of clogging the regulator's relief valve opening by lint or as you can see, by frozen moisture at this northern home is a credible one. We inspected the regulator for lint clogging (none) and during freezing weather for ice clogging on the regulator assembly (none). I can’t seem to find anything pertaining to the specs for walls that the dryer exhaust vent is cut and routed to. By that I mean any specs on the proximity of insulation in wall cavities surrounding dryer exhaust duct and drywall or other wall materials like wood paneling that are combustible and whether or not there needs to be an inch or more space of any of the above mentioned materials? at CLOTHES DRYER FIRE HAZARD WARNINGS. Owners had observed clothing coming out of the dryer "extremely hot" and compensated by always running the dryer on its lowest heat setting. Clothes dryer vents are generally installed as zero-clearance, that-is, in direct contact with wall exterior covering (siding), wall framing, insulation in the wall cavity and the interior wall covering. The reason that direct contact between the dryer exhaust vent and building materials is safe *in normal and proper operating conditions* is that normal dryer operating temperatures in the dryer drum range between 125F and 135F. (GE Corporation, ret. 2017). The highest temperature claim I've read is 150 degF (perhaps an unsubstantiated opinion). The air temperature of air exiting the dryer's heater and at the point of entry into the dryer drum or "tumbler" may be hotter, at around 175 F.
The highest temperatures occurring inside the clothes dryer are in the heater element or burner itself where they can reach between 250˚ C and 400˚ C (Marks, 2012) as cited in Bonaccorso (2012) in what I find is one of the most informed studies of clothes dryer temperatures and fire safety. 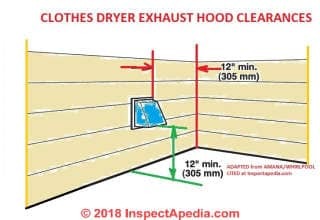 I have added links to this research in the list of references and research in CLOTHES DRYER FIRE RESEARCH - you may need to clear your browser cache and wait 24 hours for amendments to this web page to appear in your server. Our photo shows a dryer vent screen including the protective cover provided by the manufacturer. This cover clogs rapidly and is in our opinion unsafe. It was removed and left-off of this dryer vent. For example, blowing dryer lint all over the air intake of an air conditioner compressor/condenser unit will lead to higher air conditioning or heat pump operating costs, high temperatures at the unit, and possibly expensive damage to it. Watch out: to be sure that you use a listed, approved clothes dryer vent termination cover, a self-closing dryer vent. 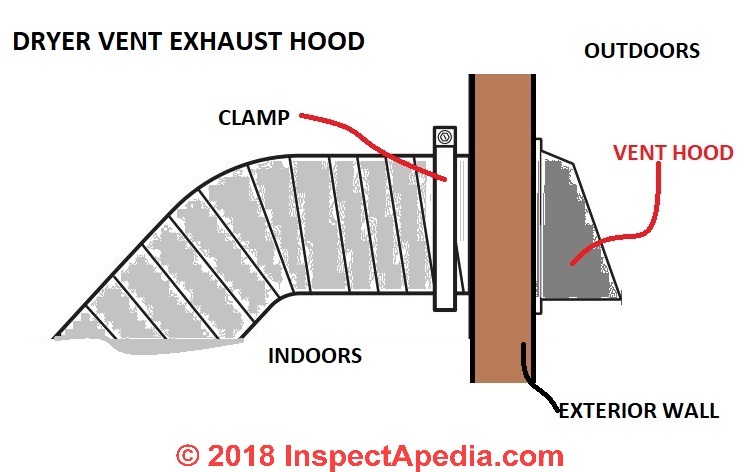 The exhaust vent cover needs to allow warm moist linty dryer air to blow out of the building without causing a lint blockage in the dryer vent duct or at the vent opening (a fire hazard) while at the same time blocking bird or rodent entry into the dryer duct system (a fire hazard) and avoiding cold air backdrafts into the structure. Also watch out for clothes dryer vents that are in contact with building materials with special combustion hazards such as some foam insulation products. Check the installation instructions for your clothes dryer - the manufacturer will give the necessary clearance distances. Common sense will also tell us that the dryer opening and controls have to be readily accessible by a user standing on the floor. Question: is 24" clearance from dryer vent to ground safe for a 30 foot dryer vent run? My electric dryer vent, after around 30' of mostly rigid straight pipe, terminates to the outside through a downward facing vent that has at least 2' of space below (before the ground) and likely a reasonable amount of air flow otherwise from left to right. Should I be concerned here? Any reason I absolutely need outside access? Anything I should do? The minimum clearance distance from the bottom of a clothes dryer vent terminating hood to the surface of the ground or to the surface of any other obstruction is 12". In areas of deep snow cover that distance may be inadequate. Your installation height sound reasonably good to me, though in areas of deep snow or if exposed to freezing there could be a safety worry if the vent can become blocked by snow or ice or frozen condensate. That 30 feet is a long run, perhaps longer than the dryer manufacturer recommends. I'd check for soot clogging in the system from time to time. If you notice clothes taking longer to dry or the dryer running extra hot those are signs of dangerous dryer vent blocking. 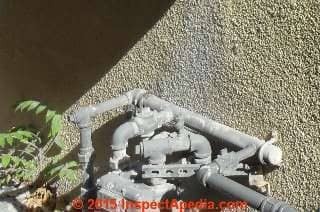 Is there any minimum distance standard that a dryer vent should terminate away from a A/C condenser? My neighbors dryer vent terminates about a foot away from his condenser. It seems to me that this could allow lint to blow all over the fins of the condenser reducing efficiency and possibly shorten the life of the condenser. Any idea? Thanks. I haven't found a code citation specifically addressing clothes dryer clearance to AC unit condensers but that topic is discussed in the article I cite above. I agree that regardless of distance, if lint is clogging the condenser fins that's going to be a problem. 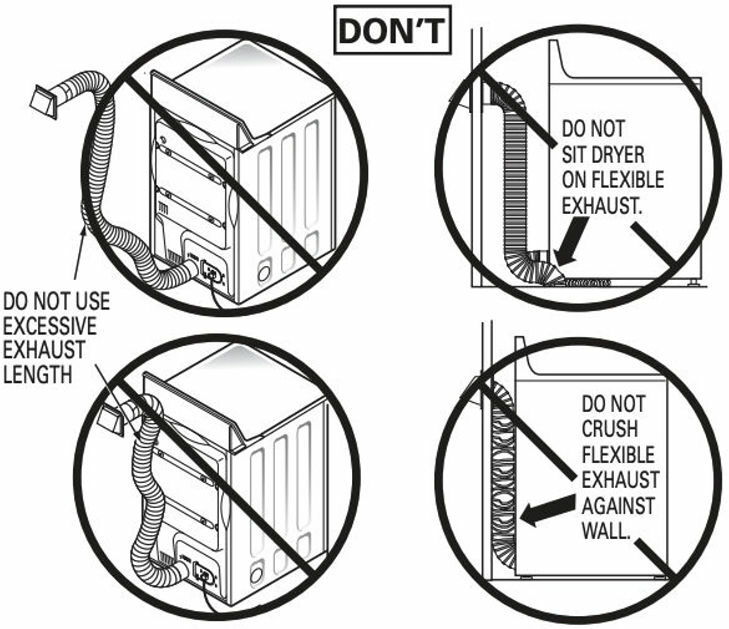 There also *might* be a problem from hot air exiting close to the condenser too. What are the risks if the dryer vent blows lint near a water heater? In our photo at above/left I don't see any risk for the water heater in the routing of this dryer vent duct: the heater is electric so I'm not worried about lint leaks clogging up a gas or oil-fired burner (that would be unsafe), and there is no heat or combustion hazard created between the clothes dryer (on the other side of the partition wall) and its exhaust vs. the electric water heater. Watch out: notice that gas piping: a gas leak anywhere in the building would of course be very dangerous, risking fire or explosion. But what about the effects of dryer lint leaks on other nearby mechanical systems. Not shown, but nearby is an oil-fired heating boiler. Lint just loves to accumulate on the oil burner air intake bands - possibly leading to poor heater operation and even in extreme cases, loss of heat. This dryer is venting properly outside, but before the installation you see at left was completed the contractor added foil tape or sealant where necessary to be sure that there was not lint leak blowing into the utility room. What is the required distance between a through the outside wall direct furnace vent and a dryer vent. I'm renting and they are very close together. I tried to find the requirements myself but was unsuccessful. Stephanie: if the direct vent furnace air intake can pull in lint from the clothes dryer the installation is unsafe. Lint clogging the direct-vented furnace could result in vent overheating and possibly a building fire. But that's a subjective opinion on my part as I have not seen an explicit clearance distance stated in model building codes nor installation instructions. 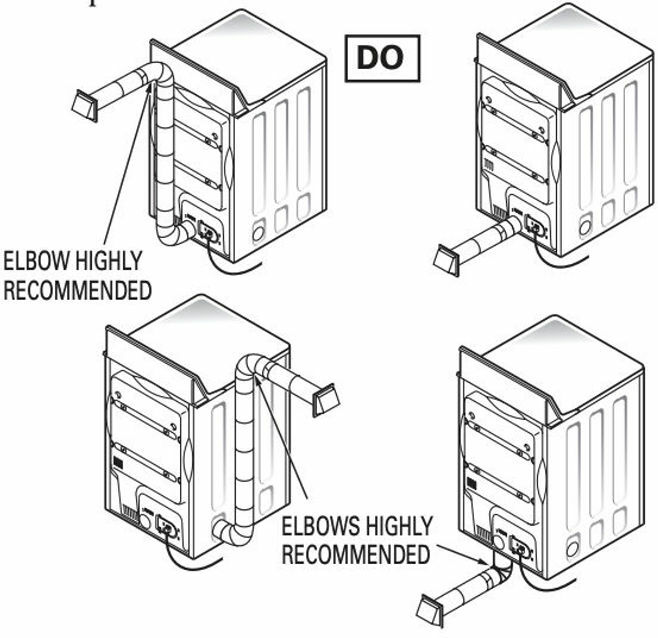 The exhaust vent terminal shall be located at least 3-feet above any forced air inlet located within 10-feet. See [the figure in the original article cited above] for a depiction [courtesy of Thermo Pride] of the minimum required clearances between vent terminations and building features according to the National Fuel Gas Code (NFGC). This article and thus my suggested specification (10 feet) recognizes that dryer lint can clog a key vent such as on a gas regulator at a distance of 4 feet nd that a significantly greater distance would be needed for safe clearance between a clothes dryer vent outlet and the air inlet of any mechanical system such as a direct vent chimney sidewall or rooftop penetration. That's a reasonable minimum distance of 10 feet. The local building code official is the final authority on questions like this, particularly as there may be site conditions that for safety should change general safe clearance distance recommendations. Clothes dryer vent outlet: Do not locate a compressor/condenser unit where the clothes dryer vent will blow onto or close to the unit. Lint-clogging of the compressor/condenser's condensing coils is likely to be a problem and the extra warm air won't help the cooling cycle efficiency or equipment life. Move the equipment or move the dryer vent. 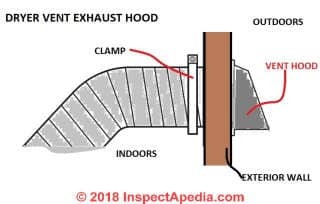 Ron, I haven't found a model building code citation specifically regarding dryer vent clearance from foam insulation products and I don't think there is one. 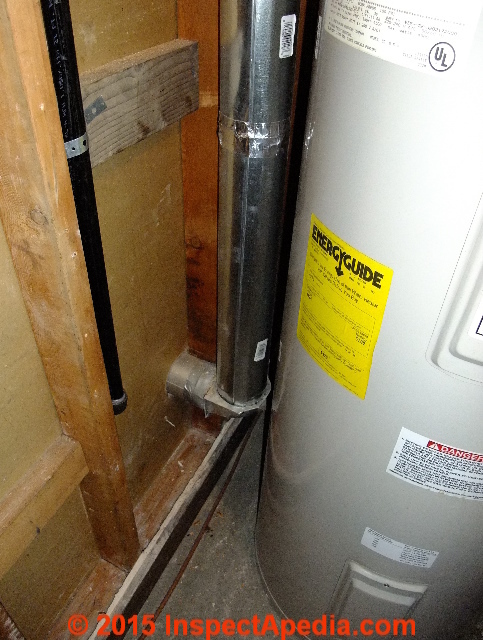 A short answer offered by some plumbing experts is that as long as you are meeting other dryer vent code requirements such as length restrictions your system should be accepted by your local code officials. Clothes dryers used in residential settings normally operate between about 125°F to 135°F. The maximum operating temperature of a clothes dryer under varying conditions might be perhaps 176°F. Thermophoresis, a chemical change that lowers the ignition point of many building materials, is unlikely to occur below about 200°F. Dryer outlet temperature will also vary depending on local conditions such as the temperature of air entering the clothes dryer. These are in-dryer temperatures or temperatures measured at the dryer vent outlet. The temperatures inside the dryer heating element may be much higher. Watch out: however some combustible foam or other building products close to or in contact with a clothes dryer vent might increase the risk of a building fire in abnormal conditions such as an abnormally-hot dryer vent caused by other problems (lint clogging, for example). A clothes dryer with a lint-clogged lint trap or exhaust can reach temperatures over 750°F, or 400°C. That's plenty hot enough to lead to ignition of some materials. The ignition point of polystyrene insulation, defined as the "transfer ignition temperature" is around 680°F or 360°C. [California Fire Marshall & EUMEPS] That's below the temperature given above for a lint-clogged clothes dryer. Fire Safety and EPS and Dryer Vents: OPINION: So even if it is enclosed within a building wall or ceiling cavity, where it might be in contact with a clothes dryer vent it would be smart to cover your polystyrene insulation with a layer of fire-resistant drywall, just as you'd be required to cover such insulation if it were exposed in the living area. 1. lint and dust from the clothes dryer may clog the combustion air inlet of your gas fired heating furnace, causing unsafe conditions and risking fatal carbon monoxide poisoning. 2. They might miss a chance to sell you a lint filter that you not only don't need, but that depending on the type and installation might itself be a serious fire hazard. If your clothes dryer is properly and safely vented to the building exterior, the release of lint around the dryer itself ought to be minimal and not a safety hazard. 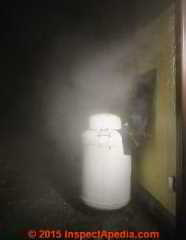 Start with a practical examination: is there dust visible in, on, or around your gas fired heating equipment? Is that dust dryer lint? If so, then a combination of housecleaning and an inspection of the dryer for dust and lint leaks is in order regardless of the dryer's exact placement. Two feet more or less distance change from a clothes dryer that's leaking lint would not make one iota of difference in safety. Working space or fire clearances from combustibles that will be specified in the gas furnace installation manual for your specific heater. 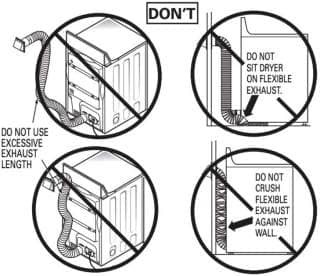 If the dryer is installed too close to the heater it violates the manufacturer's instructions, may prevent proper heater maintenance, and might be unsafe. See FURNACE CLEARANCE DISTANCES for details about the required distances around a gas fired heating furnace. I just had some maintence guys in for my furnace. They told me my dryer had to be 2 feet from my furnace. They also said that if we don't mive it within 15 days, union gas eill cut off my gas. They were also trying to sell me a "air filter system for my furnace. My furnace is only 2 years old. I live in an upstairs apt. Wirh one door to out side. My down stairs neighbor installed a laundryroom that vents above my door level and into my living room window. When they do laundry I have to shut my door and close my windows or my whole apt gets blasted. They have 2 other doors a front door and patio doors. What makes maters worse I'm on oxigen and need good air flow. I have complaimed to the manager nut he dose nothing. Is it legal to vent into someone elses living space. My OPINION is that the clothes dryer vent distance to the neighbor's fence is less of a worry than whether or not it's too close to ground level to be safely above the height of snow-cover. And I agree that you'll have trouble cleaning a vent or even inspecting it if you've only 12 " into which to insert your head and body. A related question: how did your clothes dryer vent terminate only 12" from your property line in the first place? A related question: is your house wall just 12" from the property line? Is this in compliance with your local building codes and property set-back requirements? After checking those questions with your building department you'll better-understand your arguing position. ou might point out that doing so also reduces a fire risk for them as well as for you. My exterior gas dryer vent terminates on the side of my house. New neighbors want to install a fence exactly on the edge of their property. This would leave less than 1 ft clearance between our dryer vent and their fence. Is this allowed? I'm worried that it will be very difficult to clean out the exterior vent and also ensure that deep snow and ice will be impossible to remove. Continue reading at CLOTHES DRYER LINT FILTER HAZARDS, or select a topic from closely-related articles below, or see our complete INDEX to RELATED ARTICLES below. Or see CLOTHES DRYER VENTING FAQs - Q	& A posted originally at this article. 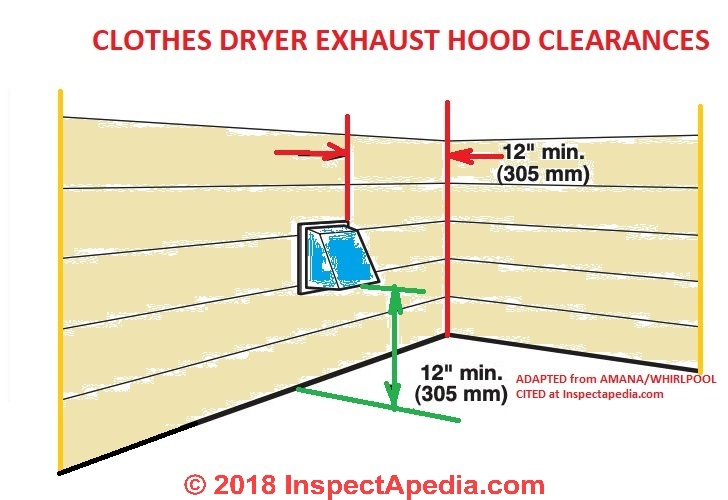 CLOTHES DRYER VENT CLEARANCES at InspectApedia.com - online encyclopedia of building & environmental inspection, testing, diagnosis, repair, & problem prevention advice.